Today we have Rangi, a puzzle game created by Digigo. 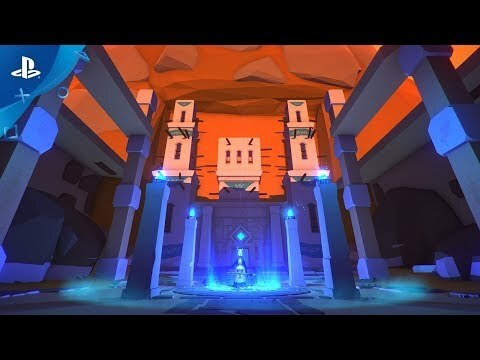 Based in an African mystical universe, Rangi (2017) today comes to PSVR. The game, which features a large space with puzzles, previously launched on Gear VR, Cardboard, HTC Vive, and Oculus Rift. Inspired by African tribal art, ancient architecture, and colorful landscapes, Rangi presents the player with a different artistic style for each level which is said to combine Africa’s diversity in terms of cultures and influences. Morocco-based indie studio Funsoft say Rangi draws its inspiration from African folklore, featuring a meditative soundtrack that focuses on the human voice while including indigenous instruments like the sanza and djembe – a sort of finger harp and a drum. And now let`s get to the gameplay and see what we have here. Solve complex puzzles, explore hidden temples, escape deadly platforms and revel in the joy of flight as you restore the Musiki’s stolen rhythms! Inspired by tribal music, art, and architecture from across the African continent, Rangi is challenging yet comfortable to play. You play as Guriki, a shaman who interacts with the environment on a quest to recover the Music Giants life force and restore rhythm to the world. Explore the environments to understand their structure. Move objects to connect colored lines and trigger various mechanisms. Reconstruct ancient statues. Use your wand to fly and recover energy fields. Navigate deadly platforms and avoid obstacles. It is a little bit strange to see objects you have never seen before, but it is all from the African culture, so I guess this is cool. The other con is that this game is released only for Android, for now, so we will have to wait for the iOS release. This game is a great chance to get familiar with the African culture. The idea itself for a puzzle game linked with the cultural heritage of a whole continent is great. I found this game for a very interesting one and I will try it definitely!